The gaming world caught a brief glimpse of this idea during Nintendo‘s E3 conference a few years ago. It was then that the company revealed the yet-to-be released (and probably never will be, if you ask me) Vitality Sensor. Stick your finger in the pulse-reading device, and your console will see your measured heart rate and design your gaming experience around that stat. Whether the data was meant to make games more relaxing or more intense was, supposedly, up to developers. Now a newly discovered Sony patent reveals a, frankly, much less dorky way of taking biometric scans of players. 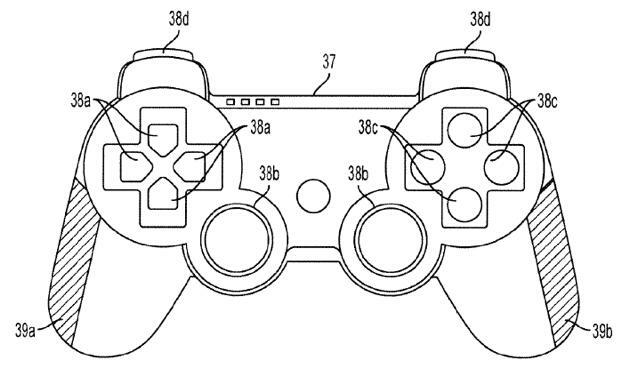 The image you see above of the PlayStation 3 controller is only one slice of the tech explained in the patent, as Sony’s technical drawings show biometric scanners on a PS Vita-like drawing and the PlayStation Move. The biometric scanning areas are 39a and 39b on the figure up top. Weapons that change depending on how stressed you are. An increase in stress level could make a weapon more accurate or less steady, which will make it difficult to target an enemy. Sony specifically mentions a sniper situation where the weapon becomes more steady if you’re relaxed. Tensing up your muscles to withstand an attack or charge up a shield. A video game character whose facial expressions, movements, posture, and even voice changes depending on your biometric data. For example, this character will sweat when a player is nervous. An adrenaline style boost which will let you run faster, jump higher, and punch harder when stressed. A health bar that depletes more rapidly if you have a high stress level. An attack button that changes a character’s move depending if the player is stressed or relaxed. Background music and scenery that changes depending on your stress level. Matching music is one example, but Sony also proposes to change music to make a player more relaxed. Brightness of objects and the zoom level, representing a higher level of focus, are two ideas for scenery. A game that adapts difficulty levels depending on a players stress level. First off, this sounds amazing. Really, games that change dynamically with my stress and predicted adrenaline levels is an awesome concept. However, and here’s something I’ll readily admit to readers, when it comes to scary games, I’m basically a child. If they’re great gaming experiences (like BioShock or Resident Evil 4, two games I know most don’t consider that scary), I’ll play through them. But I’m slow, constantly tense and generally freaked out. If you’re telling me that my gun will start to lose accuracy based on my stress level, I just might cry. I can’t imagine taking on a horde of necromorphs and having horrific accuracy as a main tool. Yikes. My childish inability to enjoy scary games aside, this sounds awesome. Would you like to see gaming shape around your biometric readings?